The Fossil Mysteries exhibition explores the prehistoric record of the San Diego region from the Cretaceous Period to the Pleistocene Epoch. This geologic timeline extends from the Hadean Eon through the Holocene Epoch. This epoch is best known as the "Great Ice Age." Ice sheets and other glaciers encroach and retreat during four or five primary glacial periods. At its peak, as much as 30% of the Earth's surface is covered by glaciers, and parts of the northern oceans are frozen. The movement of the glaciers alters the landscape. Lakes, such as the Great Lakes in North America, are formed as ice sheets melt, and retreat. Global warming begins after the last glacial maximum, 18,000 years ago. The oldest species of Homo — Homo habilis —evolves. The flora and fauna in the regions not covered by ice are essentially the same as those of the earlier Pliocene Epoch. Mammalian evolution includes the development of large forms: woolly mammoth, woolly rhinoceros, musk ox, moose, reindeer, elephant, mastodon, bison, and ground sloth. In the Americas, large mammals, such as horses, camels, mammoths, mastodons, saber-toothed cats, and ground sloths, are entirely extinct by the end of this epoch. The Holocene Epoch may be an interval between glacial incursions, typical of the Pleistocene Epoch and therefore not a separate epoch in itself. However, it is a period marked by the presence and influence of Homo sapiens . During this time, the glaciers retreat, sea levels rise, the climate warms, and deserts form in some areas. Human civilization develops. Activities of mankind begin to affect world climates. The extinction of other species continues. During the Paleocene, the vast inland seas of the Cretaceous Period dry up, exposing large land areas in North America and Eurasia. Australia begins to separate from Antarctica, and Greenland splits from North America. A remnant Tethys Sea persists in the equatorial region. Mammalian life diversifies, spreading into all major environments. Placental mammals eventually dominate the land, and many differentiated forms evolve, including early ungulates (hoofed animals), primates, rodents, and carnivores. The emergence of the Isthmus of Panama changes ocean circulation patterns and coincides with the formation of an Arctic ice cap. Plate tectonic interactions result in the uplift of the Sierra Nevada, formation of the Cascade Range, and onset of strike-slip faulting on the San Andreas Fault. In Europe, the Alps continue to rise. The global climates become cooler and drier. Camels and horses are abundant throughout North America. Ground sloths also evolve and the Great American interchange between South and North America begins. Primates continue to evolve, and the australopithecines—antecedents to Homo sapiens —develop late in the Pliocene in Africa. In North America, rhinoceroses and ordeodonts become extinct. Modern ocean currents are essentially established. A drop in sea level near the end of the Epoch isolates and dries up the Mediterranean Sea, leaving evaporite deposits on its floor. The climate is generally cooler than the Oligocene Epoch. A cold transantarctic ocean current isolates the waters around Antarctica, and the continent becomes permanently frozen. Mammal forms are essentially modern, and almost half of modern placental mammal families are present. The ancestor of mastodons disperse into North America. Almost all the modern groups of whales are present, as well as the early seals and walruses. Many modern birds—herons, rails, ducks, eagles, hawks, crows, sparrows—are present in Europe and Asia. Higher primates undergo substantial evolution; advanced primates, including apes, are present in southern Europe and Asia. Carcharocles megalodon, the largest predaceous shark ever to have lived, inhabits the seas. The coasts are submerged and kelp forests develop. On land, grasslands replace forests over large areas on several continents. Tectonic plate movement is still very dynamic. Africa and Europe nearly collide, closing the Tethys Sea and leaving as a remnant the Mediterranean Sea. Volcanism and fragmentation of western North America is associated with the emplacement of major ore deposits. The southeren ocean forms and the climate is generally temperate. Glaciation begins in Antarctica. Representatives of modern mammals become the dominant vertebrate life form, including horses, pigs, true carnivores, rhinoceroses, elephants, and camels. Oreodonts diversify in North America. Early primates appear in North America, and early apes appear in Egypt. Many archaic mammals become extinct. The earliest representatives of modern cetaceans (baleen and "toothed" whales) evolve. Grasslands expand, and forest regions diminish. Plate tectonics and volcanic activity form the Rockies in western North America. Erosion fills basins. Continental collisions between India and Asia culminate in the Alpine-Himalayan mountain system. Antarctica and Australia continue to separate and drift apart. The climate is subtropical and moist throughout North America and Europe. Early forms of horse, rhinoceros, camel, and other modern groups such as bats evolve in Europe and North America. Creodonts and ruminant ungulates evolve. Archaic whales (archeocetes) evolve from terrestrial meat-eating ungulates. Sirenians (dugongs and manatees) first evolve in the shallow Tethys Sea. Three periods: Cretaceous, Jurassic, and Triassic. Pangaea covers nearly a quarter of the Earth's surface. The Triassic Period, unlike the previous periods, is marked by few significant geologic events. Toward the end of the Triassic Period, continental rifting begins to break apart the supercontinent. The general climate is warm, becoming semiarid to arid Life began to diversify after the end-Permian extinction. Early dinosaurs evolve. Many are bipedal, fast, and relatively small. The largest Triassic dinosaurs are only 20 feet (6 meters) in length—small when compared to later Mesozoic forms. Marine reptiles evolve, such as ichthyosaurs and plesiosaurs. Ferns, cycads, ginkgoes, and conifers flourish. Mass extinctions occur at the end of the Triassic Period, reducing some marine and terrestrial groups, such as the ammonites, therapsids, early reptiles, and primitive amphibians, by as much as 75 percent. The continents—while not in their current positions on the Earth—are shaped much as they are today. South America and Africa separate, and the Atlantic ocean widens. A circum-equatorial sea, Tethys, forms between the continents of the Northern and Southern Hemisphere. The westward movement of North America forms the ancestral Rocky Mountains and the ancestral Sierra Nevada. Sea levels rise, submerging about 30% of the Earth's present land surface. The global climate is generally warm. The poles are free of ice. Dinosaurs and other large reptiles peak as the dominant vertebrate life form on Earth. Dinosaurs extend their range throughout every continent. Horned dinosaurs are common, while armored ankylosaurs and spiky nodosaurs are rare. In the shallow seas, invertebrates live in great diversity. Ammonites are a dominant group. Gastropods, corals, sea urchins flourish. The early flowering plants (angiosperms), modern trees, and many modern types of insects evolve. Near the end of the Cretaceous Period, several mass extinctions occur, including the extinction of five major reptilian groups: dinosaurs, pterosaurs, ichthyosaurs, pleisosaurs, and mosasaurs. 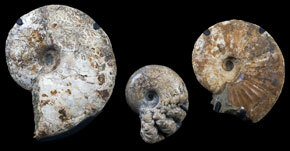 Extinctions also occur among ammonites, corals, and other marine invertebrates. The supercontinent of Pangea begins to breakup as North America separates from Eurasia and Africa. The Atlantic Ocean begins to form. Tectonic plate subduction along western North America causes the Earth's crust to fold and mountains form in the western part of the continent. Reptiles adapt to life in the sea, in the air, and on land. Dinosaurs are the dominant reptile on land. Archaeopteryx , the first bird, evolves. Early amphibians, extinct by the late Triassic, are succeeded by the first frogs, toads, and salamanders. Mammals are small, shrew-like animals. Plant forms are dominated by the cycads and cycadeoides. Conifers and gingkoes are widespread. Sedimentary rocks (sandstone, shale, limestone, conglomerate) form in shallow seas over the continents. Rodinia begins to break up into northern and southern portions. Gondwana in the south incorporates South America, Africa, Antarctica, and Western Australia as well as peninsular India and parts of Arabia. The global climate is generally mild. Marine metazoans with mineralized skeletons, such as sponges, bryozoans, corals, brachiopods, molluscs, arthropods, and echinoderms, flourish. One group of arthropods, the trilobites, are particularly dominant in the shallow-water marine habitats. Plant life is limited to marine algae. A single supercontinent, Pangaea, forms as Earth's landmasses collide and merge. Pangaea extends across all climatic zones and nearly from one pole to the other. This supercontinent is surrounded by an immense world ocean. Extensive glaciation persists in what is now India, Australia, and Antarctica. Hot, dry conditions prevail elsewhere on Pangaea, and deserts become widespread. Invertebrate marine life is rich and diverse at the beginning of the Permian period. Toward the end of this period, mass extinctions occur among large groups of corals, bryozoans, arthropods, and other invertebrates. 99% of all life perishes. On land, insects evolve into their modern forms; dragonflies and beetles appear. Amphibians decline in number, but reptiles undergo a spectacular evolutionary development of carnivorous and herbivorous, terrestrial and aquatic forms. Ferns and conifers persist in the cooler air. Two major land masses form: Laurasia (North America, Greenland, Eurasia, and Scandinavia) to the north of the equator, and Gondwana (South America, Africa, peninsular India, Australia, and Antarctica) to the south. Collisions between Laurasia and Gondwana form major mountain ranges. Coal-forming sediments are laid down in vast swamps. Global climatic changes occur, changing from warm and wet to cooler and drier. The result is a long interval of glaciation in the southern hemisphere. The diversification of fish from the Devonian Period continues in both marine and freshwater environments, though armored fish become extinct. Benthic (bottom-dwelling) marine communities include a variety of invertebrates: crinoids, blastoids, and brachiopods. The ammonites are common in open marine waters. Insects, such as cockroaches, flourish. The first reptiles evolve. Land environments are dominated by plants, from small, shrubby growths to tall trees. Early club mosses, horsetails, forest trees (Cordaites), and ferns are common. Europe and North America collide, forming the northern part of the ancestral Appalachian mountain range. Europe and North America straddle the equator. Africa and South America are positioned over the South Pole. The climate is generally warm and moist. This period is dominated by various forms of fish—armored fish, lungfish, and sharks. Ammonites evolve from nautiloids and become one of the dominant invertebrate forms. As the ozone layer forms, the first air-breathing arthropods—spiders and mites—evolve on land. Amphibians evolve and venture onto land. Plant life, including lowland forests of giant psilophyta plants, develop and spread over the planet. The North American, European, and Asian land masses are situated on or near the equator. Laurentia and Baltica collide. Gondwana sits in the south polar region. Shallow flooding of continental areas deposits sediments; later withdrawal of ocean water leaves oxidized "red beds" and extensive salt deposits. Life in seas is still dominated by invertebrates: corals, arthropods, and crinoids. Rapid evolution occurs among suspension feeders, and pelagic (open ocean) predators, such as nautiloids, become abundant. Fish evolve jaws. Late in the Silurian Period, the first sharks appear. The earliest land plants are represented by leafless, vascular plants called psilophytes. The barren continents of Laurentia, Baltica, Siberia, and Gondwana are separated by large oceans. Shallow seas cover much of North America at the beginning of the period. As the seas recede, they leave a thick layer of limestone. Later in the period, the seas recover North America, depositing quartz, sandstones, and more limestone. Metazoan invertebrates are still the dominant form of life on Earth. Corals, crinoids, and clams evolve, as well as the first early vertebrates—primitive fish with bony armor plates. Late in the Ordovician Period, mass extinctions of marine life occur, opening niches for benthic (bottom-dwelling) and planktonic (floating, swimming) organisms. Precambrian Time. Three Eons: Proterozoic, Archean, and Hadean. The Earth forms as a solid planet. No evidence of life yet known. The supercontinent Rodinia forms approximately 1.1 billion years ago. Plate tectonics slows to approximately the same rate as the present. Large mountain chains form as the continents collide. Quartz-rich sandstones, shales, and limestones are deposited over the continents. Oxygen levels increase as life on Earth develops the ability to obtain energy through photosynthesis. The late Proterozoic is an "Ice House" world. Eukaryotes (single-celled organisms with a nucleus) evolve. These are more advanced forms of algae and a wide variety of protozoa. Eukaryotes can reproduce sexually, which makes genetic diversity possible, as well as the ability to adapt to and survive environmental changes. Multi-celled, soft-bodied marine organisms (metazoans) evolve. The Earth's permanent crust is formed. Vast amounts of metallic minerals are deposited. The oceans and atmosphere result from volcanic outgassing. The earliest life forms evolve in the seas. They are the prokaryotes—single-celled organisms with no nucleus—cyanobacteria (blue-green algae). The earliest bacteria obtain energy through chemosynthesis (ingestion of organic molecules).